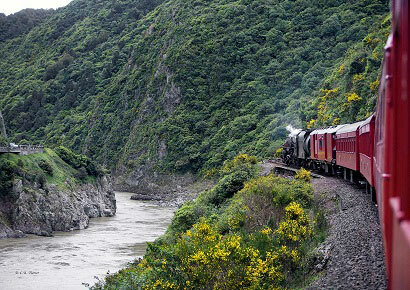 Experience the scenic beauty of New Zealand with one of our lovingly restored vintage locomotives and carriages. Find out more about each trip, then book your tickets. Hire a train or just a carriage for a memorable occasion. Look at our fleet and the work put in to restore them. Browse our photo gallery of past tours and adventures. Steam hauled excursion to Woodville via the spectacular Manawatu Gorge. Includes stop to explore the boutique shops at Shannon. Short steam train rides from Paraparaumu to Paekakariki and back. Several departures between 9.40am and 3.10pm. Steam Incorporated receives the "The PJ Dillicar Memorial Award for Innovation". Membership is open to anyone who would like to support the Steam Inc. society. There is a variety of voluntary activities to suit all people. Don’t let our name “Steam Inc” put you off. We have diesels and a variety of other tasks you can help us out. Help us restore and maintain the heritage railway for mainline operation by making a contribution through “Give a little” or contact us direct. Find a list of links to websites and publications to help you find what you need. This includes accommodation, tour operators and hobbies. Sign up for our newsletter to receive updates on future excursions and more.